Millipedes are common occasional pests that sometimes invade buildings, particularly when the weather turns hot and dry. While millipedes sometimes enter in large numbers, they do not bite, sting, or transmit diseases, nor do they infest food, clothing or dry, structurally sound wood. Millipedes vary in both color and size. The most common species that invades buildings is the" garden millipede," which is brownish-black in color and about one inch long (Figure 1). Although millipedes are often called "thousandleggers," they actually have far fewer legs, but each body segment has two pairs of very short legs. When disturbed, millipedes often curl up into a "C" shape and remain motionless. They crawl slowly and protect themselves by secreting cyanide-like compound that has an unpleasant odor. Some people confuse millipedes with centipedes, which look somewhat similar. Centipedes have only one pair of legs per body segment (Figure 2) and the legs are usually longer than those on millipedes. 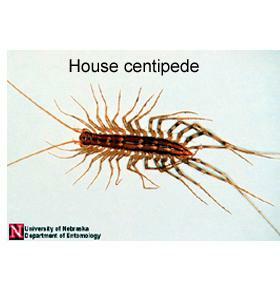 Centipedes also tend to move about more quickly than millipedes. Figure 2. Centipedes have one pair of legs per body segment. Millipedes have two pairs of legs per segment. Millipedes pass the winter primarily as adults and lay their eggs in the soil in the spring. Individuals may live for several years. Millipedes are attracted to dark, cool, moist environments that are rich in organic matter such as compost piles, heavily mulched shrub or flower beds (Figure 3), rotting logs, or the soil under logs and stones. They usually go unnoticed because they live in these relatively hidden habitats. Millipedes are scavengers, feeding primarily on decomposing vegetation, but occasionally they will damage soft-stemmed plants in gardens. 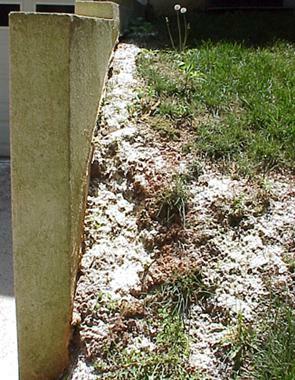 Major nuisance problems usually occur when the conditions become too hot and dry and the millipedes move to find moisture, or else when it's too wet and water-saturated soils force them to the surface and higher ground where they often end up on concrete slabs, foundations and siding. Millipedes may also migrate in the fall, presumably in search of overwintering sites. All of these activities result in millipedes invading crawl spaces, basements and other areas of buildings. Common points of entry include door thresholds (especially at the base of sliding glass doors, garage doors), expansion joints, and through the voids of concrete block walls (Figure 4). Frequent indoor sightings of these pests usually means that there are large numbers breeding outdoors in the lawn, or beneath mulch, leaf litter or debris close to the foundation. Millipedes do not survive indoors for more than a few days (more likely just a few hours) unless they can find suitable moist conditions. Figure 3. Moist-wet mulched garden beds are attractive breeding grounds for millipedes. Mulch and thick vegetation touching the foundation and/or covering siding allow millipedes easy access to the house and can make chemical treatment difficult. Figure 4. Millipedes at a door threshold. Pesticides are typically a short-term solution to a long-term problem. 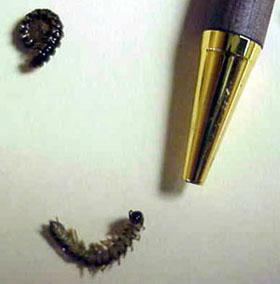 Emphasis should be placed first on reducing conditions and access points favorable to millipede invasions. Minimize moisture, remove debris - The most effective, long-term measure for reducing entry of millipedes (and many other pests) is to reduce excess moisture and hiding places, especially near the foundation. Remove leaves, grass clippings, heavy accumulations of mulch, wooden boards, stones, boxes, and similar items laying on the ground beside the foundation. 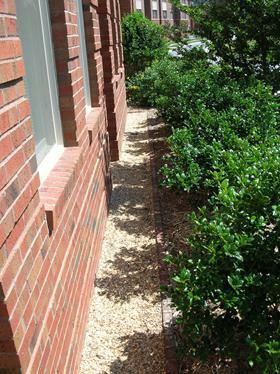 This does not mean you can't have mulch around the foundation; simply keep it 6-12 inches away from the wall. Use inorganic mulches such as gravel which will drain better (Figure 5). Prevent water from accumulating near the foundation, in basement walls or in the crawl space. Keep gutters and downspouts free of debris and use either splash guards or perforated pipe to reduce puddling. Homes with poor drainage may need to have foundation drains installed, or the surrounding ground contoured or sloped to redirect surface water away from the foundation. Repair leaking exterior water spigots and prevent water from puddling where there are drip lines from air conditioning units. Reduce the humidity in crawl spaces and basements by providing adequate ventilation, sump pumps, polyethylene soil covers, dehumidifiers, etc. Since millipedes thrive in the moist, dense thatch layer of poorly maintained turf, de-thatching the lawn and keeping the grass mowed close should make the lawn less suitable for millipedes. Over-watering may also contribute to millipede problems. 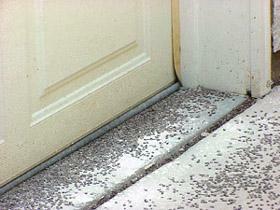 Seal pest entry points - Seal cracks and openings in the outside foundation wall (Figure 6), and around the sills of doors and basement windows. Install door sweeps on all exterior entry doors, and apply caulk along the bottom outside edge and sides of door thresholds. Seal expansion joints where outdoor patios, sunrooms, and sidewalks abut the foundation. Expansion joints and gaps should also be sealed along the bottom of basement walls on the interior to reduce entry of pests and moisture from outdoors. 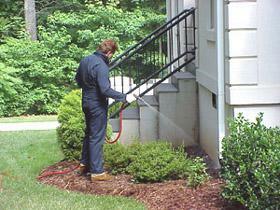 Spraying mulch is ineffective because the chemical can bind to the mulch and not penetrate to the soil. Heavy accumulations of mulch and leaf litter should be raked back from the foundation first to expose millipede hiding areas and allow the pesticide to penetrate the soil more readily. Keep children and pets away from treated areas until the chemical dries (or longer if specified on the product label). Watch out for pesticide drifting and contaminating toys, swimming pools, and other objects, such as grills. Consult your county Cooperative Extension center or the North Carolina Agricultural Chemicals Manual for a list of some appropriate pesticides for millipede control. Figure 5. 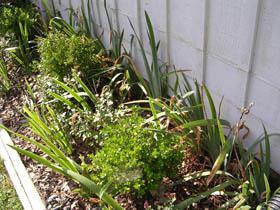 Use a gravel border 6-12" out from foundation walls to allow for better drainage. Figure 6. 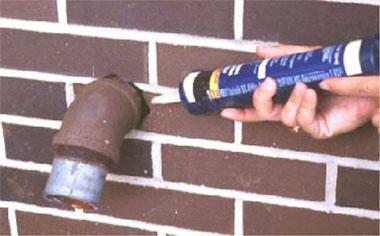 Caulking and sealing gaps in foundations and around windows and doors can help keep out millipedes. Figure 7. Insecticidal dusts can be somewhat effective against millipedes but they should never be spread in areas where children or pets can come into contact with them. Figure 8. Perimeter spraying an insecticide. Information contained in this publication was taken from M. Potter, University of Kentucky, and W. Lyon, Ohio State University.